2016 Money on My Mind in Los Angeles! 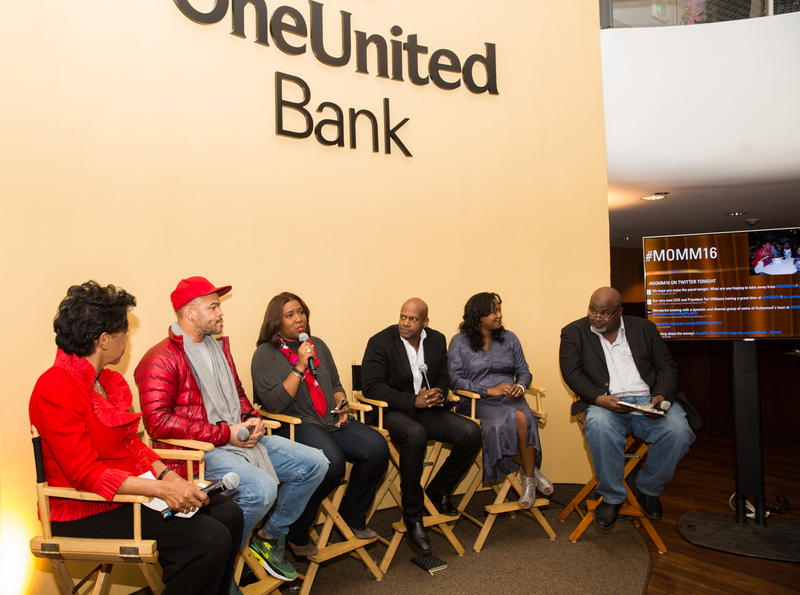 OneUnited Bank in partnership with the African American Film Critics Association (AAFCA) sponsored Money on My Mind™ at OneUnited Bank’s Crenshaw office in Los Angeles on Saturday, February 6, 2016. The event was a continuation of OneUnited Bank’s efforts to use creative ways to increase financial literacy in urban communities. Close to 200 people attended to hear a panel of acclaimed writers in the film industry, including Wendy Calhoun, Sherri McGee McCovey, Rob Edwards and Anthony Marcus Hemingway, share their career paths and the opportunities to make money behind the camera. The panel of writers generously shared the highs and lows of their careers and quantified for the audience the financial costs and rewards. They shared very specific advice including the importance of investing in yourself by continuing to write, whether or not you are getting paid, to find “your voice” and specializing in a particular genre to improve your craft and build a reputation…rather than writing for a wide range of genres. They each began with humble beginnings serving as assistants and even a soda deliveryman and used entry level opportunities to distinguish themselves, learn the industry and network. One of the writers mentioned how he dressed in a suit as a soda deliver, because he was a writer who happen to be delivering soda at that time…not a soda deliverer who aspired to be a writer. Another mentioned how she took a job as an assistant, which ultimately led to writing assignments. They also recommended the importance of knowing your value (industry information is available, but a good lawyer to negotiate can be more important than an agent) and the importance of unions, benefits and pensions. Another strong recommendation was the importance of having family, friends and/or professionals review your work before it’s presented…and that a finished product by a good writer may have been edited 80 times. Sending a script to someone who can say yes to a project is asking for a day out of their life…make it worth their time. The panel also shared specific dollars for different assignments including $75/day for an Assistant job to hundreds of thousands and even multi-million dollars for a good script. They also discussed the importance of creating a “sizzle reel” to showcase your work and gain a following on social media, which increases your chances of getting funded. The importance of social media is a recent phenomenon. The panel discussion was followed by a Q&A session with the audience. 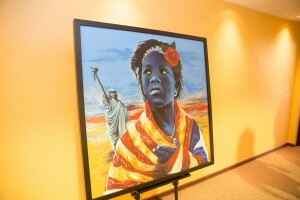 The event was held on the two levels of the OneUnited Bank Los Angeles headquarters office and included a gallery for Lady Liberty, a trilogy of paintings by Addonis Parker, an international acclaimed artist from Miami. Lady Liberty was originally unveiled in Miami during Art Basel Miami, has traveled to Los Angeles and will be traveling to OneUnited Bank’s Boston office. The paintings will be on display in Los Angeles in honor of Black History Month. OneUnited Bank President & COO, Teri Williams, and President of AAFCA, Gil Robertson, moderated the panel discussion. Ms. Williams also spoke about the importance of banking with OneUnited Bank and other Black-owned banks to build wealth and fund future projects. We want to thank the panel of writers for taking the time to share their knowledge and expertise. You were absolutely fabulous! 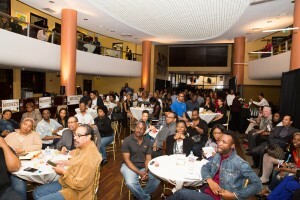 And another thanks to AAFCA and Gil Robertson! I have an account with One United Bank, I wish this event could be repeated again next Month during Women's History Month.Thank you!